Baccarat is one of the old casino games and this game was first played by the elite people of France in the 17th century. For the past 2-3 hundred years it was a game for elite people of the society only. Now the situation has changed and this game has become the game for all class people of the society. This game has the highest betting amount among other card games but now for many land based and online casinos the betting amount become lower than ever and you can even bet $20 per hand. The baccarat rules are simpler than other card games and you can easily learn that. Baccarat has some rules what you must follow while playing the game. Baccarat rules are so easy to learn and memorize and anyone can do that within a few minutes. This game is known as the Single Play game where you can make single move for your hand but in blackjack there are more than one moves per hand. You can bet three ways in this game and they are betting on player's hand, betting on banker's hand and betting on tie hands. There are three versions of this game but one version has some simple difference with other versions. So if you learn the original baccarat rules then you can play every version of the game. The game has the simple rules. The cards 2 to 9 have their own face value and the 10 cards and all face cards have the value zero and every ace has the value one. If your hand value is over 10 then you have to count that as the original value minus ten as an example if your hand value is 14 then your hand will be counted as 14-10=4 point. You have to score 9 or near nine to win the game. 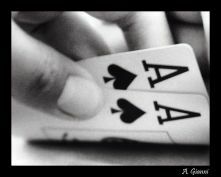 The game begins when the dealer deals two cards to players and two cards to banker. The original rules said that one player and banker can play the game at a time but now many players and banker can play the game at a time but the cards value comparing will be happen for the single player and banker hands no exception. After comparing the hand that got highest point will win and get the winnings. If the player or banker got 8 and other got 9 then 9 will win the game. If any of the players don't have 8 or 9 value then the cards can be drawn again and this draw process happen by some critical rules and the player can't decide about the draw process all the process will be done by the rules.